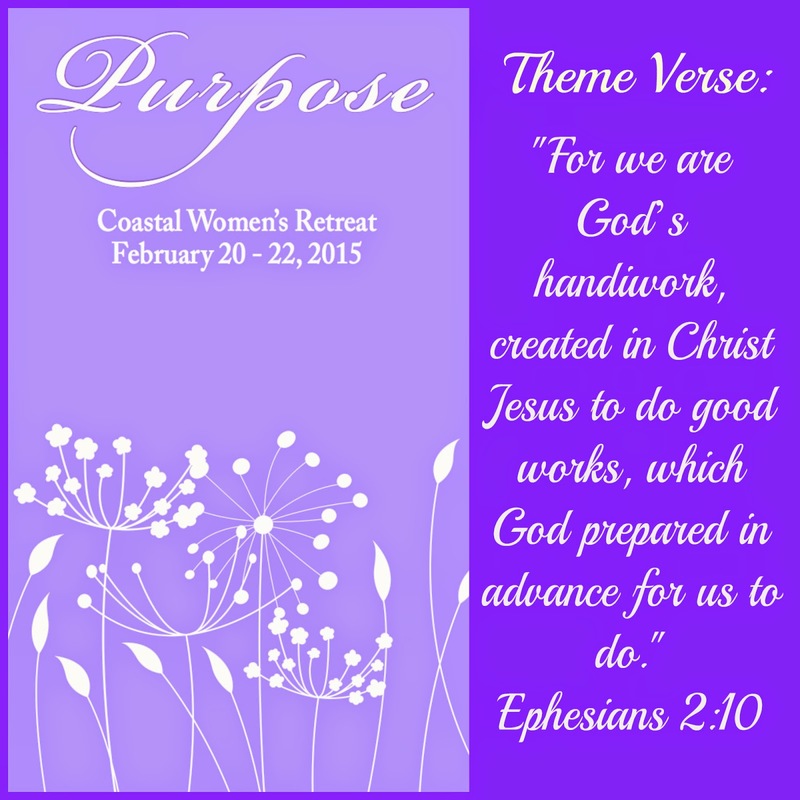 This weekend, I had the opportunity to travel to Fort Caswell for the Coastal Women's Retreat. The theme was Purpose and our theme verse was Ephesians 2:10. We started with a worship service on Friday night. Tara Furman from Knowing God Ministries was the featured speaker and Cindy Johnson from Stage2 Ministries led us in music. Then on Saturday we had 3 breakout sessions, followed by another service led by Cindy and Tara that night and another on Sunday morning. Throughout the entire weekend, I was reminded again and again of God's faithfulness and our call to obedience. Yes, I realize the weekend was about finding our purpose but it fits- just take a look at the theme verse, "...we are God's handiwork, created in Christ Jesus...which God prepared in advance for us." God didn't create us to be purposeless, mindless, zombies. We are created for a purpose and He gives us that purpose. Before we were born, He knew what gifts we needed to fulfill the purpose that He created us for. God is faithful. And we see the obedience that is required on our parts in the rest of the verse, "...to do good works...for us to do." Other than the basic commandments given to all believers, only you and God can truly know what your purpose is. I thought Tara did a great job of emphasizing the importance of daily quiet time with God and how that is key in hearing from Him what His purpose is for us. Then once we hear from God we are expected to obey. And it's sometimes very difficult to do, but if God is so faithful to us, shouldn't we be faithful to Him? If you have never attended a Women's conference or retreat, I highly recommend going. If your church is going on one- sign up and go with them. If they aren't, then maybe you should find one or plan one and advertise it for the women in your church. We were made for community. And the best way to be part of the community of believers is to be with them. Attending church is excellent and necessary, in my opinion, but when you get to go on a trip with your sisters in Christ and see each other without make-up and stay up late playing Bible Outburst or Phase 10 and just talking and laughing, then you really begin to build strong relationships and form strong communities. See when you have community, your sisters in Christ, who would like nothing more than to get home as quickly as possible to see their husbands and kids, instead back-track 40 minutes so they can make sure you get home after your car gets rear-ended. And though we didn't call everyone, there is no doubt in my mind that any of the women that had gone with us would have driven back to get us if we'd called them. That is what being part of the body of Christ is about- loving one another. And that is one of the purposes for which we were created. As for your other purposes, well that's between you and God!